Blackwater’s Erik Prince was a shoo-in for the plan. But who is Stephen Feinberg? Jared Kushner has been busy, and not only with the Russians. This week, amid the hoopla surrounding his meeting with a Moscow lawyer about the 2016 election, the The New York Times published an intriguing story about his role in a plan to privatize the war in Afghanistan. 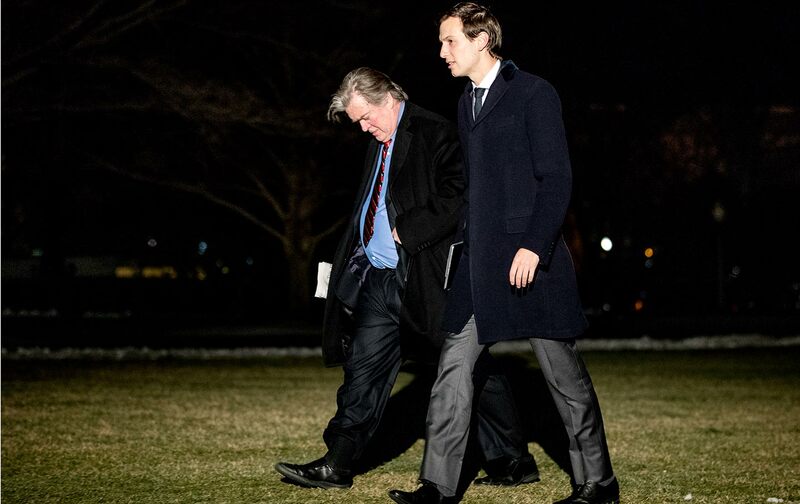 Last Saturday, Trump adviser in chief Stephen Bannon, with Kushner’s backing, went to the Pentagon to arrange a discussion between Defense Secretary Jim Mattis and “two businessmen who profited from military contracting,” the Times reported. These weren’t ordinary contractors: They were Erik Prince, the notorious founder of Blackwater, the all-purpose mercenary army, and Stephen Feinberg, a New York financier who owns and controls DynCorp International, the largest US contractor in Afghanistan. At the meeting (which neither Prince and Feinberg would confirm), they urged the Pentagon to turn the war over to what they call “private military units” who would fight for profit as an alternative to the Pentagon’s recent proposal to send thousands more US military troops to Afghanistan to fight the Taliban. To their apparent disappointment, Mattis, the Times reported, “listened politely” to their audacious proposal, but “declined to include the outside strategies” in a review of Afghanistan policy that is being led in the White House by Trump’s national-security adviser, Lt. Gen. H.R. McMaster. The Times story screamed conflict of interest. Prince, as most Americans know, cut his mercenary teeth sending his private army into Afghanistan with the CIA shortly after 9/11. He then became persona non grata in the US government after contractors under his command killed dozens of civilians in Iraq. But after selling his company and moving on to organize a private army for the United Arab Emirates, he became a key adviser to Trump on military issues. In an interview with Bannon’s Brietbart News a day after his Pentagon meeting, he spelled out his proposals. On Thursday, Sebastian Gorka, Trump’s deputy assistant for national-security affairs, seemed to endorse the proposals when he was asked about the Mattis meeting in an interview with CNN’s Jake Tapper. Unlike Prince, however, he, is virtually unknown to the American public, and likes to keep it that way. For those who have never heard of him, here’s a snapshot of who he is, the significance of his private-equity industry, and how he and other national-security investors could benefit in the event that Mattis changes his mind and decides to send Blackwater—or its latest incarnation—back into Afghanistan. Feinberg first came to public attention last February, after Cerberus informed investors that he might be appointed to a high-level position in the Trump administration that would require him to provide “voluminous information” about conflict-of-interest issues. Trump, it turned out, wanted Feinberg to lead a “broad review” of US intelligence agencies, and was also considering him for top spots at the Pentagon and the Department of Homeland Security. Feinberg got in the door in part because he is a close friend of Bannon’s, who is notorious for his proposals to destroy “the administrative state” by privatizing or eliminating essential public services. During the 2016 campaign, Feinberg was part of a group of private-equity and venture-capital investors who advised Trump and became his “staunchest defenders” during the race, according to a Wall Street Journal report last November. Among them were Wilbur Ross, the chairman of WL Ross & Co., who is now secretary of commerce, and billionaire Peter Thiel, the co-founder of intelligence contractor Palantir Technologies Inc. But after Feinberg’s name was floated to lead his review of intelligence, Trump got pushback from US officials who feared his involvement would “could curtail their independence and reduce the flow of information that contradicts the president’s worldview,” the Times reported. Meanwhile, lawmakers got nervous; at a Senate hearing in late February, Senator Susan Collins (R-ME), said she was concerned that “an individual who runs a private equity firm” was being considered to review intelligence for Trump. So Feinberg’s name quickly disappeared—until last week. Now, it appears that Trump has given the financier the green light to operate on his own, with help from Bannon and Kushner. It’s a two-front press, with Prince selling his mercenary interests and Feinberg his visions for his private-equity industry. As US military and intelligence operations have been privatized over the past 15 years, the companies that work for the government have becoming increasingly reliant on deep-pocketed investors with strong ties to the Pentagon and the 16 agencies that make up the “intelligence community,” or IC. Enter private equity. With their extensive connections to current and past national-security officials, and with access to huge pools of private capital that invest in their funds, private-equity firms have become de facto managers of the contracting industry. Their power is magnified by the huge number of mergers and acquisitions in recent years. In the world of spying and surveillance, these deals have led to an incredible concentration in the industry, with five corporations now employing about 80 percent of all intelligence contractors. Many of these were reshaped, and owe their current market power, to private-equity funds such as the granddaddy of national-security investing, the Washington-based Carlyle Group. Carlyle was led for many years by Frank Carlucci, a former deputy director of the CIA, who was a pioneer in the early years of privatized intelligence. Over a period of about 10 years, it bought (and then sold) many top contractors. Until recently, it owned a majority share of Booz Allen Hamilton, a key NSA contractor and a key adviser to the IC with extensive contracts in most major agencies in civilian and defense intelligence. Another fund, Veritas Capital, sold DynCorp to Cerberus in 2010 and has relied for its advice on retired generals Barry R. McCaffrey and Anthony C. Zinni as well as Richard Armitage, the former deputy secretary of state in the Bush administration. More recently, DC Capital Partners, an offshoot of Veritas, has become a key investor in intelligence with the purchase of military-intelligence contractor Michael Baker International. Its advisers include former NSA Director Michael V. Hayden. Feinberg’s Cerberus is best known for its Republican executives, such as former vice president Dan Quayle and John Snow, who was George W. Bush’s treasury secretary. Quayle got his start as a top Cerberus executive during the 1990s buying and selling “distressed assets”—also known as bankrupt companies—in Asia. More recently, Quayle and Snow have been managing Cerberus’s investments in European property debt. In the arena of national security, Feinberg’s firm has cultivated ties with some of the most established names in intelligence. One of them, according to the Bloomberg profile mentioned earlier, is Leon Panetta, who was President Obama’s CIA director and “an adviser to Cerberus on security and intelligence matters.” Another is Michael Morell, the CIA’s deputy director under Obama who worked for Feinberg for a time after he retired in 2013, also according to Bloomberg. And then there’s DynCorp, the centerpiece of Cerberus’s huge investments in national security; few companies are as well positioned for the Trump presidency. DynCorp is heavily involved in all aspects of the US wars in Iraq and Afghanistan and for years has been engaged in military and intelligence operations, including flying planes for the drug wars in Central America, operating surveillance aircraft for the Afghan military, and training US-backed armies in Iraq and Liberia. It’s also much bigger than Blackwater ever was: In 2015, it was awarded a $100 million contract by the US Army to provide “advisory, training and mentoring services” to Afghanistan’s national army and police (Trump’s cutbacks at the State Department, however, have cut into its earnings in recent months). Providing private warriors would not be the only function for Feinberg’s companies, however. Trump, for example, has said he is pushing the Pentagon to create “safe zones” in Syria, where US military forces and civilians from the US Agency for International Development would “protect” Syrians fleeing from the war. This plan has yet to come to fruition, but could be rolled out after the US and Russia organize their cooperative relationship in Syria announced by Secretary of State Rex Tillerson after Trump’s recent meeting in Germany with Russia’s Vladimir Putin. This is exactly the kind of operation DynCorp is experienced in—and why it’s a major player in the International Stability Operations Association, the lobbying arm of the private-security industry. “DynCorp is a highly successful provider of critical support to military and civilian government institutions, and also have important commercial business in aviation, infrastructure development, security and logistics,” the company’s description claims on the ISOA website. So, even with business as usual, Feinberg could find an angle.